The cost of cellular deployments, initially developed for high volumes of high speed data, is often considered too expensive for widespread IoT use due to excessive power consumption and complex protocols that decrease battery life. 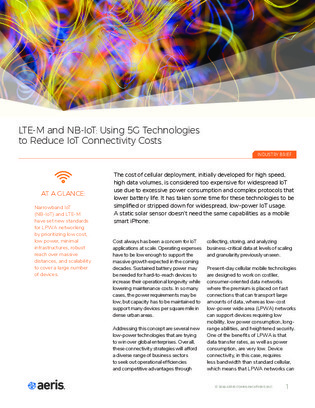 This resource takes a look at how narrowband IoT (NB-IoT) and LTE-M have set new standards for low-power WAN by prioritizing low costs, low power, minimal infrastructures, robust reach over massive distances, and scalability to cover a large number of devices. Learn about the ongoing evolution of NB-IoT and how it’s shaping cost and coverage considerations for enterprise IoT deployments.